You've probably read about it in newspapers and seen it on the news: in the United States, the number of obese children and teens has continued to rise over the past two decades.1 You may wonder: Why are doctors and scientists troubled by this trend? And as parents or other concerned adults, you may also ask: What steps can we take to help prevent obesity in our children? This page provides answers to some of the questions you may have and provides you with resources to help you keep your family healthy. 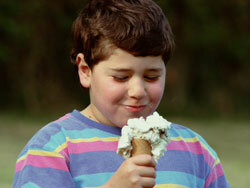 What can I do as a parent or guardian to help prevent childhood overweight? Childhood obesity is associated with various health-related consequences. Obese children and adolescents may experience immediate health consequences and may be at risk for weight-related health problems in adulthood. Less common health conditions associated with increased weight include asthma, hepatic steatosis, sleep apnea and Type 2 diabetes. To help your child maintain a healthy weight, balance the calories your child consumes from foods and beverages with the calories your child uses through physical activity and normal growth. Remember that the goal for overweight and obese children and teens is to reduce the rate of weight gain while allowing normal growth and development. Children and teens should NOT be placed on a weight reduction diet without the consultation of a health care provider. One part of balancing calories is to eat foods that provide adequate nutrition and an appropriate number of calories. You can help children learn to be aware of what they eat by developing healthy eating habits, looking for ways to make favorite dishes healthier, and reducing calorie-rich temptations. The recipes that you may prepare regularly, and that your family enjoys, with just a few changes can be healthier and just as satisfying. For new ideas about how to add more fruits and vegetables to your daily diet check out the recipe database from the FruitsandVeggiesMatter.gov. This database enables you to find tasty fruit and vegetable recipes that fit your needs. Children and teens should participate in at least 60 minutes of moderate intensity physical activity most days of the week, preferably daily.11 Remember that children imitate adults. Start adding physical activity to your own daily routine and encourage your child to join you. 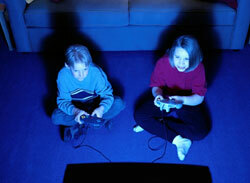 In addition to encouraging physical activity, help children avoid too much sedentary time. Although quiet time for reading and homework is fine, limit the time your children watch television, play video games, or surf the web to no more than 2 hours per day. Additionally, the American Academy of Pediatrics (AAP) does not recommend television viewing for children age 2 or younger.12 Instead, encourage your children to find fun activities to do with family members or on their own that simply involve more activity. Here are some additional resources that you (and your child) can use to help reach or keep a healthy weight through physical activity and healthy food choices! Worried about your child's weight? For children, BMI is used to screen for overweight, but is not a diagnostic tool. For more, see About BMI for Children and Teens. This Web site provides information about childhood overweight, including how overweight is defined for children, the prevalence of overweight, the factors associated with overweight, and the related health consequences. Provides information about physical activity for you and your children. Great recipes and information about how to incorporate fruits and vegetables in your daily meals. Confused about portion sizes? Play the CDC's portion control game! Provides a tailored explanation of how to balance your meals and includes an interactive game for kids. This national education program is designed for parents and caregivers to help children 8-13 years old stay at a healthy weight. The booklet "Finding the Balance: A Parent Resources" offers an array of easy to use practical tips and tools for parents and guardians to help their children and families eat healthy, increase physical activity, and decrease screen time. Have fun, stay active and healthy. Learn what it takes to blast off in the food pyramid space shuttle! Check out Carla and her friends. Hey! It's what you do. 1 Ogden CL, Carroll MD, Curtin LR, McDowell MA, Tabak CJ, Flegal KM. Prevalence of overweight and obesity in the United States, 1999-2004. JAMA 2006;295(13):1549–1555. 2 Dietz W. Health consequences of obesity in youth: Childhood predictors of adult disease. Pediatrics 1998;101:518–525. 3 Swartz MB and Puhl R. Childhood obesity: a societal problem to solve. Obesity Reviews 2003; 4(1):57–71. 4 Rodriguez MA, Winkleby MA, Ahn D, Sundquist J, Kraemer HC. Identification of populations subgroups of children and adolescents with high asthma prevalence: findings from the Third National Health and Nutrition Examination Survey. Arch Pediatr Adolesc Med 2002;156:269–275. 5 Luder E, Melnik TA, Dimaio M. Association of being overweight with greater asthma symptoms in inner city black and Hispanic children. J Pediatr 1998;132:699–703. 6 Mallory GB, Fiser DH, Jackson R. Sleep-associated breathing disorders in morbidly obese children and adolescents. J Pediatr 1989;115:892–897. 7 Fagot-Campagna A, Narayan KMV, Imperatore G. Type 2 diabetes in children: exemplifies the growing problem of chronic diseases [Editorial]. BMJ 2001;322:377–378. 8 Must A, Anderson SE. Effects of obesity on morbidity in children and adolescents. Nutr Clin Care 2003;6:1;4–11. 9 Whitaker RC, Wright JA, Pepe MS, Seidel KD, Dietz WH. Predicting obesity in young adulthood from childhood and parental obesity. N Engl J Med 1997; 37(13):869–873. 10 Serdula MK, Ivery D, Coates RJ, Freedman DS. Williamson DF. Byers T. Do obese children become obese adults? A review of the literature. Prev Med 1993;22:167–177.